Set in modern times, 7 Sins appears to be the first chapter in a longer series where a race of horrible gribblies, who look something in-between Lovecraftian monsters, Chaos gods and Cenobites, are invading. Humanity’s only defence is FAITH, Federal Armcorp to Interdict Transdimensional Horror (I had to look up the word Interdict; it means forbid). The game will include PVC moulded miniatures designed by a star studded cast of miniature sculptures and be manufactured by Dust Studios. There’s a teaser image of one of the miniatures and so far it looks very pretty even if it is your typical tentacle horror. The most interesting aspect to me, is that this game is being designed by Eric M Lang. Eric is has been involved in the development of some really top games including Quarriors, Call of Cthulhu the Card Game and Chaos in the Old World. My concern with miniature based games is that the miniatures often obfuscate the game itself and we can end up with an amazing looking game that doesn’t play very well but with Mr Lang at the helm I’m sure we’re going to end up with a stellar game. 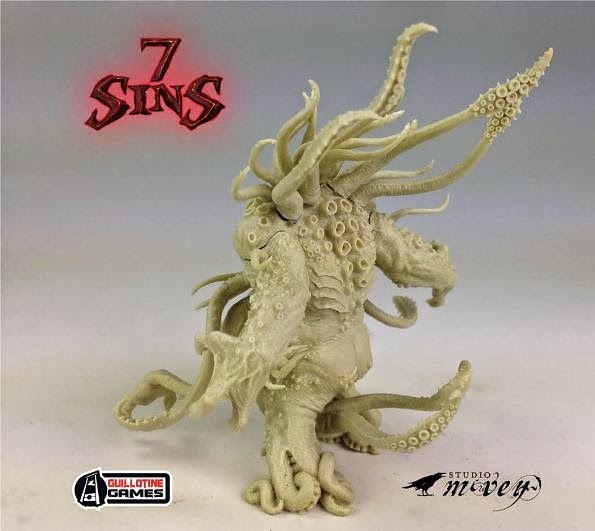 7 Sins will be on show at Gen Con 2014 and is due for release in 2015. Judging by the history of Studio McVey and Guillotine Games I should imagine this will be heading to Kickstarter.